Atempo solutions ready for the General Data Protection Regulation (GDPR)! Atempo solutions ready for GDPR! 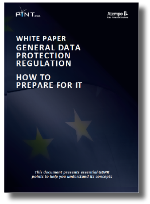 GDPR (General Data Protection Regulation) will, as of May 25th 2018, govern how organizations manage data privacy and data protection for their employees as well as their customers, partners and all stakeholders. GDPR is major EU legislation with many far-reaching impacts for all. All Atempo solutions have a clear, centralized management console for physical and virtual machines protected on site and off site. Automatic data retention management and fully automated data recycling are part and parcel of our solutions. Always know what you have backed up, where your data is located and who has access rights. Data is always transferred fully encrypted to the target storage. Without the decryption keys and full authorization, it's impossible to exploit personal data.